a selection of the 1000+ players at Hay on Wye this year in May. Everyone played with the first prototype of the game. It's official. We're now developing a brand new version of Bookchase® for kids (and for the adults who never quite grew up!). It's based on all the written works of Roald Dahl - one of the world's most popular children's authors. The game will feature fantastic illustrations from Quentin Blake who illustrated many of Dahl's books. We hope the game will launch Jan/Feb 2009 and we plan to go on tour with a giant version - perhaps borrowed from the BFG!!! Bookchase® or chasse de livre? 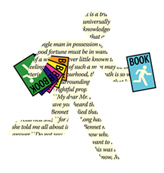 Where can you get Bookchase®? Had a warm, friendly chat with an ex-barrister called Jerina from Croatia who has given up law because she feels it is corrupting and too slow to change to the needs of modern society. She was enthusiastic about the nature of ideas and a genuinely friendly person. We swapped stories about Lizzie Magie's first version of the game which later became Monopoly (via Charles Darrow) - and originally called The Landlord's Game - actually a moral game against the evils of property ownership and capitalism.